Legacy Capital offers unparalleled investment banking services to private companies, specializing in mergers and acquisitions , private placements , business valuations and financial consulting . Our experienced team of professionals is dedicated to providing comprehensive representation and advisory services across a broad range of industries. We create solid relationships with our clients through personalized service and by delivering exceptional results. Legacy Capital was founded in 1994 and is based in New Orleans, Louisiana. Legacy assists companies in the sale of the majority or all of the equity or assets of a business. We strive to obtain the best possible terms for the selling shareholders by devising a selling process tailored to meet their specific goals and needs. We emphasize selecting the “right” buyer, who will consider the interests of management. We assist private companies in raising equity from investors, private equity & venture capital firms. Entrepreneurs interested in raising private capital for start-up ventures or early stage companies can take advantage of exemptions from state and federal registration processes through a private placement offering. Legacy provides valuation studies in connection with the contemplated sale of a company, a potential acquisition, a recapitalization or reorganization, or an evaluation of capital needs and sources. Legacy counsels corporate clients on developing and implementing short-term and long-term financing plans. New Orleans, LA – September 28, 2018 – Legacy Capital, an advisory firm specializing in investment banking for private companies, is pleased to announce that its client, Lynch Biologics, LLC (“LBIO”) (www.lynchbiologics.com) has closed on a transaction with Luitpold Pharmaceuticals Inc. (“LPI”), under which LBIO has acquired all rights relating to GEM 21S® Growth Factor Enhance Matrix, and certain additional assets related to LPI’s dental regeneration business. The transaction transfers all ownership rights to LBIO for the global commercialization of GEM 21S®, including the downstream formulation, fill and finish manufacturing rights. LYNCH Biologics will market the GEM 21S® product together with a suite of complementary regenerative biologic products direct to oral surgeons, periodontists and implant dentists through its cranio-maxillofacial division. New Orleans, LA – June 7, 2018 – Legacy Capital, an advisory firm specializing in investment banking for private companies, is pleased to announce that as of May 22, 2018, its clients, Penick Produce Co., Inc., Penick Business, L.P., and Penick L.P., have sold the entirety of Penick Produce and significant land assets in Penick Business and Penick LP in Vardaman, MS to local sweet potato operator Alexander Farms. Legacy Capital Announces the Acquisition of Network USA, LLC and Sun America Communications, LLC by Conterra Ultra Broadband. New Orleans, LA – January 29, 2018 – Legacy Capital announced today that its clients, Network USA, LLC and Sun America Communications, LLC (collectively “NUSA”), have signed a definitive agreement to be acquired by Conterra Ultra Broadband Holdings, Inc. (“Conterra”). Network USA is a rapidly growing builder, owner and operator of facilities-based lit and dark fiber primarily in Louisiana and Texas with a successful operating history of nearly two decades. NUSA serves the same industry customer segments as Conterra: wireless and landline carriers, healthcare organizations, government and mid-sized as well as Fortune 500 enterprises. Legacy Capital served as NUSA’s exclusive financial advisor in connection with the transaction while Butler Snow, LLP acted as NUSA’s legal advisor. Terms of the transaction, which is subject to pending regulatory approvals, are not being disclosed. 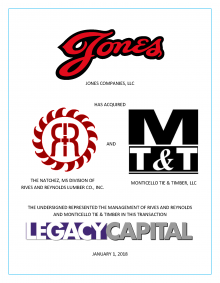 New Orleans, LA – February 5, 2018 – Legacy Capital, an advisory firm specializing in investment banking for private companies, is pleased to announce that as of January 1, 2018, its clients, Bruce and Terry Reynolds, management of Rives and Reynolds Lumber Co., Inc. (R&R) and Monticello Tie & Timber, LLC (MT&T) have sold the Natchez, MS division of R&R and the equity of Natchez, MS based MT&T to Jones Companies. R&R was founded in 1971 and operates hardwood sawmills in Louisville and Natchez, MS. For 17 years, the Natchez mill has sold primarily kiln-dried and air-dried lumber both domestically and internationally. MT&T, purchased in 2006, operates a small-log tie and timber sawmill that sells railroad ties and timber to treating facilities and rough green lumber to domestic manufacturers. The companies source raw materials including Red Oak, White Oak, Ash, Poplar, Cottonwood, and Pecan logs locally and have built a strong reputation in the Mississippi lumber community.